This image requires standard red-blue (red-cyan) 3D glasses. Careful, not all 3D glasses are the same! This was originally titled "Chrysler Bldg Johannesburg 1953". It was taken by my distant relative Byron Bird in Johannesburg, South Africa in the summer of 1953. He was a mining engineer, and was visiting the Douglas Colliery just outside of Johannesburg. The pseudo-art deco building in the background is not facetiously named "Chrysler Building". It really was a Chrysler dealership. Other car dealerships line the street, but I haven't figured out where exactly in Joburg this was taken. 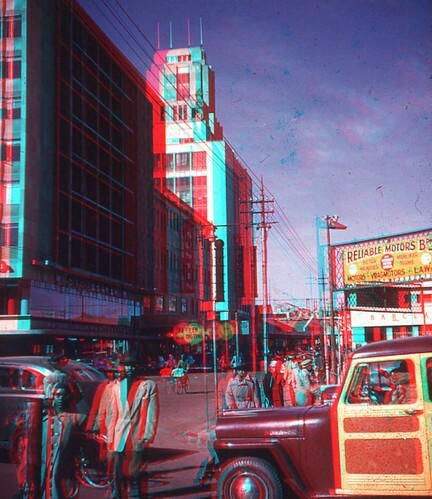 The photo was a Kodachrome stereoview transparency. The 3D image was made from those two transparencies using Stereo Photo Maker, a great piece of free software. Here are just the 3d images.